Set out to explore Costa Rica and discover the wildlife of its rainforest: toucans, monkeys, jaguars and more! Let’s charge into the jungles of Costa Rica in search of exotic animals. With any luck we can find 3 types of relatively common animals; a Chestnut-Mandibled toucan, a Basilisk, or a Capuchin monkey. It will take even more luck to find a rare Jaguar, a Red-eyed stream frog, or a Rhinoceros beetle. These animals can be found in one of 3 different terrain types; wetlands, highlands, and forests. The object of the game is to collect the best set of animals using your 6 explorers that you start the game with. 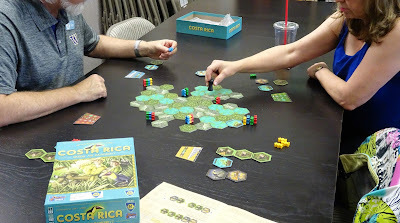 The board is constructed of 61 hexagon terrain tiles with animals on the back of each. Six groups of explorers containing an explorer for each player are placed at each corner of the hex-shaped board. The first player, as expedition leader selects one of these groups of explorers to move to an adjacent tile. This tile is flipped over revealing the animal(s). The expedition leader then decides if he/she wants to keep this tile or pass and let the others, in turn order to also choose or pass on the tile. If no one takes the tile the leader flips over another tile adjacent to the first tile and then decides to take all of the revealed animals or pass giving the same option to the others in this expedition group. When a player decides to take the animals discovered so far, they take the tiles and place them face up in front of them and remove their explorer from that expedition group. That explorer is finished exploring for the remainder of the game. On another player’s turn he/she can choose to explore with that group as long as they still have an explorer in the group. The first player pawn moves to the next player who begins a new expedition. There is one small catch during an expedition. In addition to animals on the flip side of the terrain tiles, there could also be a mosquito attached to the animal. Mosquitoes are considered a threat and revealing a second mosquito ends the expedition and that round. The mosquito tiles are discarded but the leader gets to keep any remaining tiles and must remove his explorer from the expedition. A new round is started with first player (leader) moving to the next player who then begins a new expedition. The game ends when all explorers have been used or all tiles have been explored and claimed. Players score points for each set of animal type. The more of an animal in your set the greater the points, i.e. 3 jaguars are worth 6 points while a set of 5 jaguars are worth 15 points. Additionally, you gain 20 bonus points if you have at least one of each of the 6 types of animals. The player who scores the most points wins. Costa Rica is a great family game that’s easy to learn and play that provides press-your-luck challenges. Each terrain type has a different chance of finding two animals instead of one, as well as differing levels of mosquito danger. Do I go for the rare jaguars to try and complete my set of different animals knowing that the mountains where they reside has the greatest mosquito threat or do I play it safer and head for the forest that has the least amount of mosquitoes? Do I try to become the last member in an expedition group surrounded by tiles all to myself which may yield some great finds? 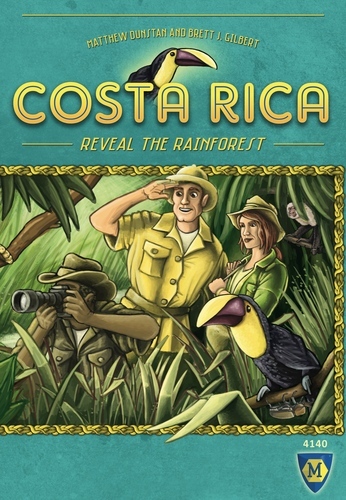 We have an open copy of Costa Rica available in our Demo Games Library for you come in and try.